(P1) Anyone staring out the office window on an endless Friday afternoon might dream of giving it all up for the good life on a sunny, sandy Caribbean island. (P2) Noelle Hancock actually did it. (P3) On Cosmopolitan.com, Hancock explains why she walked away from her $95,000 salary as a journalist in New York City, her East Village apartment, and most of her belongings to move to St. John, the smallest of the US Virgin Islands. 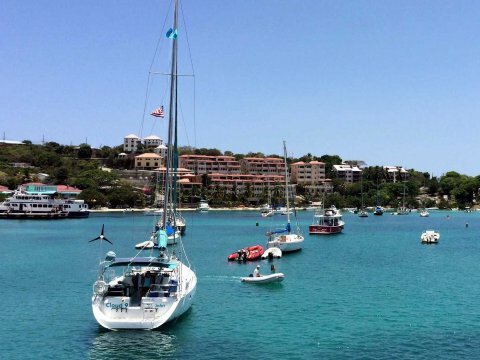 (P4) Four years ago, she broke her apartment lease, sold her possessions, and bought a one-way ticket to the USVI, where she took a job scooping ice cream. (P5) Hancock was 31 years old, a graduate of Yale University, and came from a conservative Southern family that was unhappy with her decision. (P7) Perhaps there was something INDULGENT and PETER PAN-ish about this new lifestyle. But the truth is, I was happier scooping mint chocolate chip for $10 an hour than I was making almost six figures at my previous corporate job. It was calming to work with my hands. I met new people constantly, talking face-to-face instead of communicating via email and instant messaging. When I closed the shop at the end of the shift, my work was done and my time my own. (P9) Hancock MUSES that pursuing a NON-TRADITIONAL path has opened her up to a whole world of opportunities and lifestyles — none of which provide the familiar financial stability and predictable career path of her life in New York. (P11) These days, I work as a bartender, a job I pursued simply because it’s something I always wanted to try. Sometimes I think back to the question I used to be asked in job interviews: “Where do you see yourself in five years?” That always seemed a depressing NOTION, to already know what you’d be doing five years in the future. (P12) Here it’s not unusual for someone to work as a cook on St. John, then move to Thailand for six months to work as a dive instructor, then they will head off to Alaska and work on a fishing boat. Living abroad has exposed me to a different approach to life, one in which you’re not expected to settle in one place and do one kind of job. Perhaps some of us are meant to move around every few years, change jobs and live many different micro-lives. (P13) Hancock isn’t the only one who’s been inspired to create the lifestyle she dreams of. Jonathan Banks spent four years sailing the world instead of showing up for his MBA; Danika and Chris Garlotta have turned to FREELANCE jobs to support them as they tour the globe; Scott Leonard moved his wife and three sons onto a 50-foot boat to manage his company from distant shores; Jonathan Look sold everything he owned to spend his retirement abroad. (P14) If you ask people like them, there’s more outside that office window than traffic. Have you ever thought about making a big change in your life? If you did, do you think other people would criticize you? Noelle Hancock found the freedom she dreamed of on a Caribbean island. What does freedom mean to you? Noelle Hancock was trying to escape from the “rat race” of work and financial obligations. Is the rat race very bad in your country? What is the best job you have ever had? What is the worst?